Branch meetings are an excellent starting point for beginners and intermediate researchers looking for friendly helpful advice on how to progress their research. They also allow the more advanced researchers to keep up to date with changes and pick up the latest information. 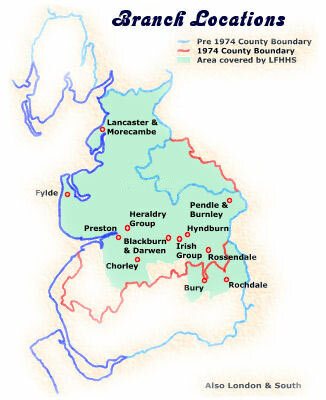 If you live in, or plan to visit, Lancashire just click on the name of the place you are nearest to (in the left column of this screen) for full details of when and where branch meetings are held, together with its speaker and activity programme. Branches have access to the Society's library and large collection of graveyard inscriptions, transcribed over many years by our members. These are housed at the Society's rooms and are accessible by arrangement. Branches also have data on CD and microfiche as well as printed matter.